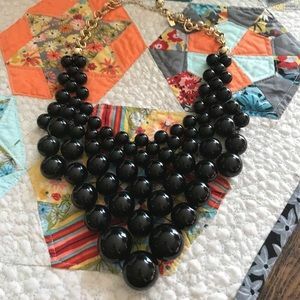 Kate ♠️ spade black bubble necklace rare. Beautiful blue, charcoal, clear beaded necklace. Black, Purple, green and turquoise necklace. White and gold beaded necklace, beautiful on! Pearls, white ribbon & jewels on a silver chain. Pearls & jewels on a silver chain.